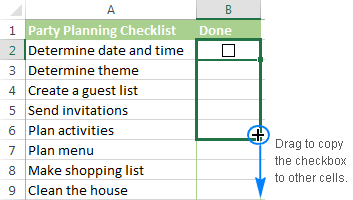 This tutorial will guide you on how to make a checkbox in Excel and use the check box results in formulas to create an interactive checklist, to-do list, report or graph. I believe everybody knows what a checkbox is, you must have seen plenty of them on various forms online. Still, for the sake of clarity, let me begin with a brief definition. A check box, also referred to as a tick box or checkmark box or selection box, is a little square box where you click to select or deselect a given option. 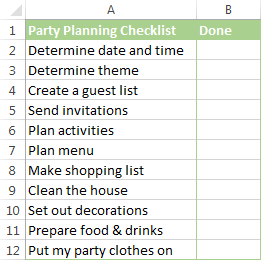 Inserting a checkbox in Excel sounds like a trivial thing, but it opens up a host of new possibilities for your worksheets that will keep you on track with your goals, schedule, assignments, etc. 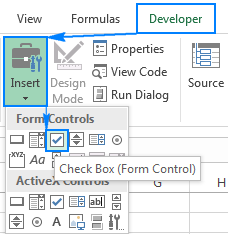 Like all other Form controls, the Check Box control resides on the Developer tab, which does not appear on the Excel ribbon by default. So, you need to turn it on first. 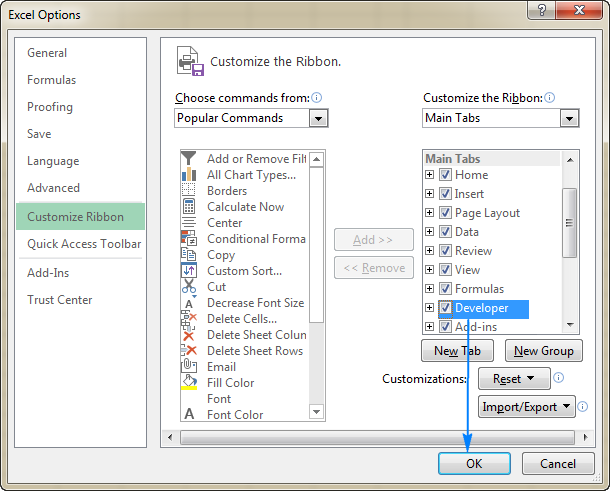 Right-click anywhere on the ribbon, and then click Customize the Ribbon… Or, click File > Options > Customize Ribbon. Under Customize the Ribbon, select Main Tabs (usually it is selected by default), check the Developer box, and click OK.
Now, with the Developer tab in place, you get access to a host of interactive controls, including Check Box. 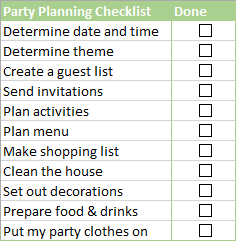 If you are creating an Excel checklist or to-do list, the first step is to make a list of tasks or other items for which the check boxes will be inserted. 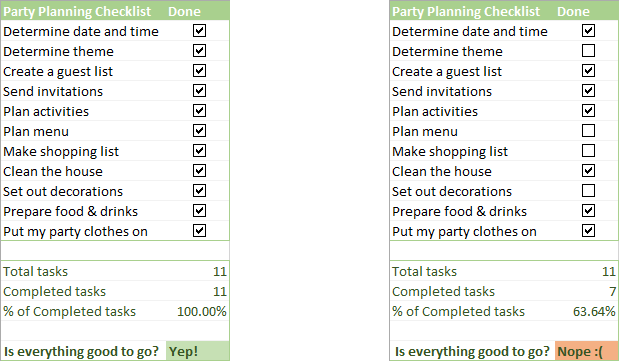 The preparation steps are completed, and now we are getting to the main part - add checkboxes to our Party Planning list. On the Developer tab, in the Controls group, click Insert, and select Check Box under Form Controls. To properly position the check box, hover your mouse over it and as soon as the cursor changes to a four-pointed arrow, drag the checkbox where you want it. To remove the text "Check Box 1", right click the checkbox, select the text and delete it. Or, right click the check box, select Edit Text in the context menu, and then delete the text. Your first Excel checkbox is ready, and you just have to copy it to other cells. Select the cell with the check box by using the arrow keys on your keyboard, and position the cursor over the lower right corner of the cell. When the mouse pointer changes to a thick black cross, drag it down to the last cell where you want to copy the checkbox. 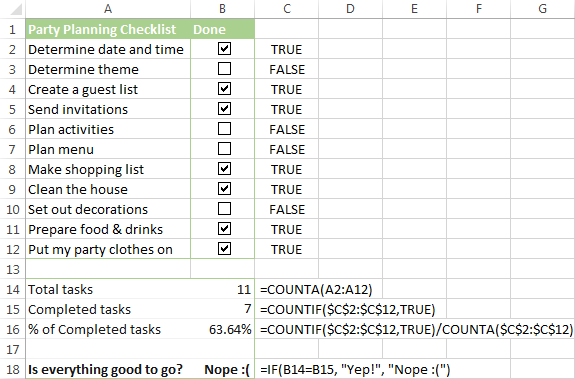 As you can see in the screenshot above, our Excel checklist is almost ready. Why almost? Although the checkboxes are inserted and you can now check or uncheck them by simply clicking on a box, Microsoft Excel is not able to respond to these changes because no cell is linked to any of the checkboxes yet. The next part of our Excel Checkbox tutorial will teach you how to capture the user selecting or clearing a checkbox and how to use that information in your formulas. 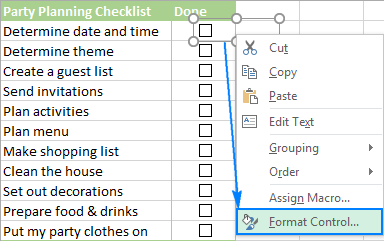 Below you will find a few examples of how to use checkboxes in Excel to make an interactive checklist, to-do list, report and chart. But first, let's learn how to link checkboxes to cells. 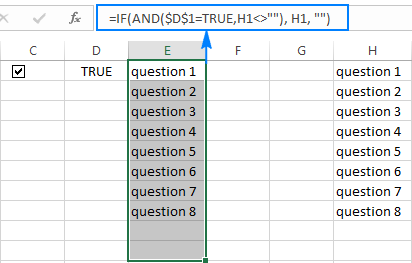 The technique is very simple, but it's the corner stone of using the checkbox results in your formulas. Right click the checkbox, and then click Format Control. Repeat the above step for other check boxes. Tip. To easily identify the linked cells, select them in an adjacent column that does not contain any other data. This way, you will be able to safely hide the linked cells later so they won't clutter your worksheet. At this point, the link cells probably don't make much sense, but please bear with me just a little longer and you will see how many new opportunities they provide to you. In fact, we have already done the major part of the job by adding check boxes and linking them to cells. Now, we will just write a few formulas to create a data summary for our Excel checklist. Where A2:A12 are the checklist items. Where C2:C12 are the linked cells. In this case, if you delete some irrelevant item(s) from your Excel checklist, but forget to remove a check symbol from the corresponding box, such checkmarks won't be counted. To embellish your checklist a bit further, you can create a couple of conditional formatting rules that will change the color of cell B18 depending on its value. 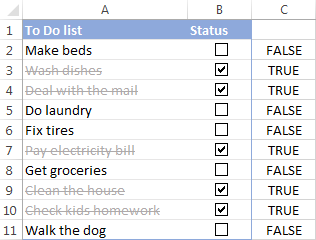 Once that's completed, hide the column with linked cells, and your Excel checklist is done! To quickly get a selection of checklist templates for Excel, click File > New, type "checklist" in the search box, and press Enter. This effect can be easily achieved by creating a conditional formatting rule. The detailed steps follow below. And now, apply conditional formatting that will give the strikethrough format and, optionally, a different background or font color to the checked items. Select a list of tasks (A2:A11 in this example). 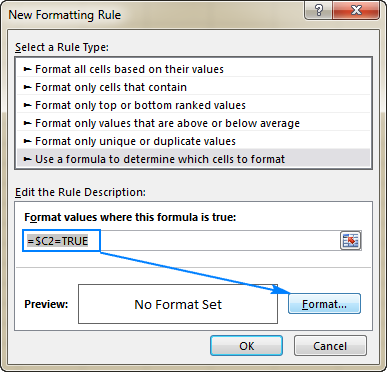 In the New Formatting Rule dialog box, select Use a formula to determine which cells to format. Where C2 is the top-most linked cell. Tip. If you have little experience with conditional formatting, you may find the following detailed guidance helpful: Excel conditional formatting based on another cell value. As of now, whenever a certain box is checked, the corresponding item gets formatted in the light grey font color with a strikethrough. Where E2 is the top-most linked cell. Lastly, add a couple of formulas to calculate the completed tasks (like we did for the checklist), hide the linked cells, and your Excel To Do list is good to go! 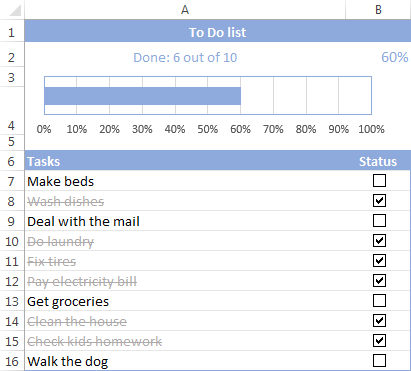 The bar chart at the top of the To-Do list is based on the percentage formula in B2. If you are curious to know the details, I encourage you to download the template, unhide columns D and E, and investigate the formulas. 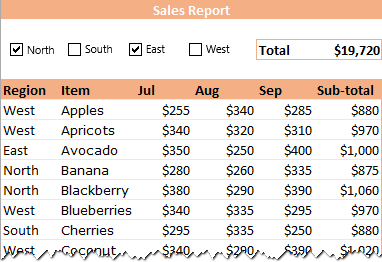 Another useful application of checkboxes in Excel is for creating interactive reports. Supposing you have a sales report that includes data for 4 regions: North, South, East and West. Your aim is to get the total for one or more selected regions. Of course, this can be done by using the Slicers feature of an Excel table or PivotTable or by inserting Subtotals. But why don't we make the report more user-friendly by inserting 4 checkboxes at the top? Add 4 checkboxes at the top of the sheet, for the North, South, East and West regions. In the above screenshot, I2:I5 are linked cells and H2:H5 are the region names exactly as they appear in the report. Type a heading for the formula column that exactly matches the heading of the corresponding column in the report (Region in this example). The exact match is very important and on the next step, you will understand why. Database is your table or range including the column headings (A5:F48 in this example). Field is the column you want to sum. It can be supplied either as the column heading enclosed in the quotation marks, or a number that represents the position of the column in the database. In this example, we add up numbers in the Sub-total column, so our second argument is "sub-total". Criteria is the range of cells that contain your conditions, including the column heading (J1:J5). That is why the heading of the formula column in the criteria area should match the column heading in the report. 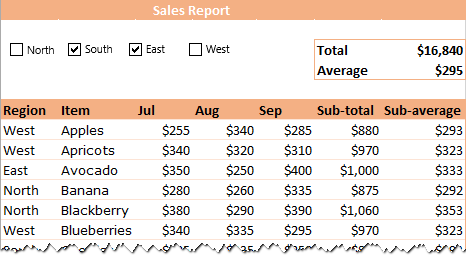 If in addition to total, your report calculates an average for each row, you can use the DAVERAGE(database, field, criteria) function to get a sales average for the selected regions. Finally, hide and probably lock the criteria area to prevent accidental changes, and your interactive report is all set! Create checkboxes and link them to empty cells. If the 2013 checkbox is selected (G2 is TRUE), the formula pulls the original value from B4, otherwise returns the #N/A error. In cell L4, enter the formula =$D4, and copy it down to L7. Because the data for the year 2015 should always be displayed in the chart, an IF formula is not needed for this column. Create a combo chart based on the dependent data set (I3:L7). Since we have linked all cells in the dependent table to the original data, the chart will update automatically as soon as any change has been made in the original data set. This is how you can create and use checkboxes in Excel. To review all the examples discussed in this tutorial, you may want to download our sample Excel Checkbox worksheet. I thank you for reading and hope to see you on our blog next week. 57 Responses to "How to insert a checkbox in Excel - create an interactive checklist, to-do list and report"
The checkboxes for the interactive report & the dynamic charts are the equivalent of slicers, provided your data are in an Excel Table. Isn't it easier to use slicers? Thank you for your comment. Sure, slicers are very easy to use if your data is organized in a table or PivotTable. 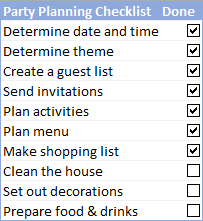 But this tutorial targets check boxes and I wanted to demonstrate a few uses other than conventional check lists and to-do lists. Can you help me to set below formula. Thank you for this extremely interesting and useful tutorial. One observation I have is that it is quite laborious linking the Format Control dialog box to cell references - they have to be done individually - if you have a long list this could take a while! Is there an easy way round this? I just did the VBA method and it was very easy and useful! Is there a way to make a check box cycle through a tick, a cross and blank through clicking the check box? I tried to make a box which shows the value from another cell. Therefore the value links to the cell. Could you please to tell me how to link the value in the box to the cell? In the Checkbox control, you can only put a tick mark and nothing else. Please consider creating a drop-down list instead based on the desired cells. Yes, I found the way... I would like to put the number above the speedometer chart but I could not put the box above the chart (with the value link to the cell). Instead of that I used the chart title which links to the cell. 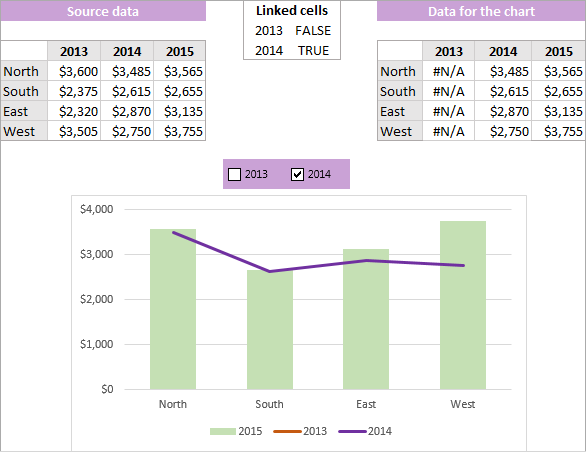 Therefore once the value of the cell changes, the value inside the chart title also changes. very good tips. I am using the above tips. I will be grateful, if, I will guided how the "to be done lists" will be automatically forwarded to my email as a reminder. I need some help: I have multiple check boxes in multiple rows. I have 6 check boxes going across the spreadsheet. I'm having difficulty with: If all check boxes are checked then TRUE. If a check box is NOT checked, then FALSE. Any suggestions are greatly appreciative. Ideally, I want to track which person has which items. If a person has all items, then it's good. If a person does not have all the items then I know I need to do some follow up. Thank you!!!! This is VERY helpful! This is close to what I'm trying to do. I want to create a list of instructions depending on the outcome of a check box. 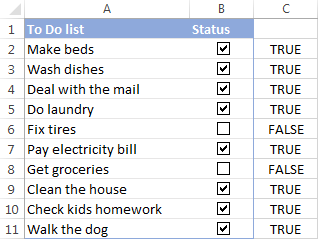 So clicking one check box in say C1 would display a long list of To Do's in another column. The list is built from numerous rows on another sheet of ideally from a "library" of text boxes for different tasks. I have a list of say 10 questions with Yes/No check boxes. If an answer is yes, I want to display a predefined list of "To Do's" from a given textbox or table. Can you help me find the answer?? I'm trying to do this as well. Any insight will be greatly appreciated! 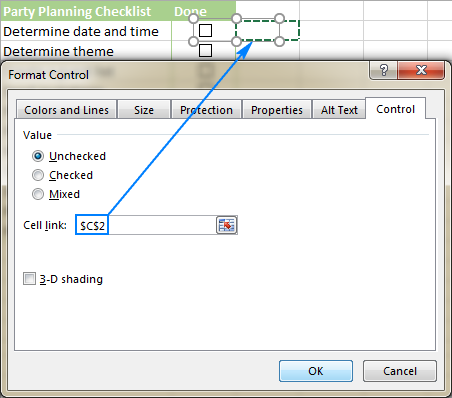 - Link check boxes to some cells (say, link a checkbox in C1 to cell D1), the column of linked cell can be hidden later. Where D1 is a linked cell and H1 is the first entry of the list to be pulled. In the example above, is there a way to combine 2 criteria? For example, what is the total of avocados sold in East region? Or any other similar combination? if the problem with your checkboxes isn't gone and you still need our assistance, please, email us at support@ablebits.com with a screenshot of your checkboxes and the info about your Excel and Windows versions that you're currently using. Don't forget to link this article and your commentary number in your email letter. We will get back in touch. I used Excel 2013, and these are the default checkboxes, I did not resize them. 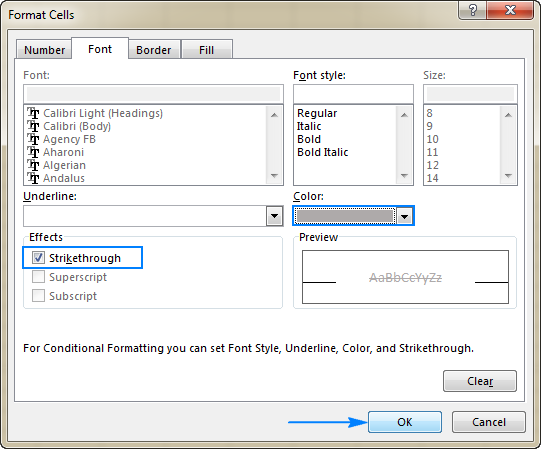 To resize a check box, right-click it, click Format Control, switch to the Size tab, and set the desired size. The easiest way to resize a checkbox is drag the sizing handles using the mouse. Or, you can right-click the checkbox, and then click Format Control... > Size. To fix the position of a checkbox in the sheet independently from the cells, right-click the checkbox, click Format Control > Properties, and select the "Don't move or size with cells" option. how to insert tick mark in Excel 2007.
how to hyperlink in a cell by using if function to open the different data. how to create drop down list to open different different data or sheet in excel 2016. Awesome! Thank you so much. Great tutorial! I have a template to utilize each month and I would like to clear the checkbox each month and utilize the list again. The checkboxes are a great tool, but I have a problem. I have like 1000 checkboxes in my file, do I need to link them to a cell one by one? Its a to do list that the employees must fill in for every job. So its the same list always repeating itself. But when I copy/paste it, and I click on the checkbox of the first job, the checkbox of the second job is also selected.. Unfortunately, it is not possible to link checkboxes to cells in bulk. You can only do this individually for each checkbox. I've got list of parts in excel - number, name and symbol. I wish that i mark checkbox in the line with one of part number -> part number will be copied to another place with name and symbol - how it is possible to make ?? -> I'm an enginier and sometimes I have to order parts for my machines. It would be nice if someone will share knowledge with me - or give me solution. Very helpful article, I learned many new things, thank you! I have an additional question though. I'm trying to build something like a form, where people would tick, let's say the "Male" or the "Female" box. Is there a way to add a restriction so that people would be unable to check both boxes? So when they click on one box, it gets checked, but if after that they click on the second box, the second gets checked while at the same time the first gets unchecked. I am attempting to place a check box on my spread sheet that when it is checked, it will ignore or delete the contents of another box in a formula. I am not having much luck. Any suggestions? Hi Svetlana. Thanks for this info. Just wanted you to know your tutorial is still getting mileage! Is there a formula to make the check box check automatically if a cell is filled out. For example check box in a4, I want it to check if I put info in cell a3 otherwise leave blank if that cell is blank. or you could put the formatting instead on A4 BUT linked to B4 being either FALSE or TRUE as above... and then hide B column. Have left =COUNTBLANK(A3:A3)=0 range as A3:A3 a 'range of 1' but could be changed to any range, but obviously this means that all cells in the range would have to have data present. If you need the reverse, change =0 to =1 to get FALSE = Data Present. No check boxes to tick, no having to remember, its automatic, its reminding you all the time! until you enter some data! 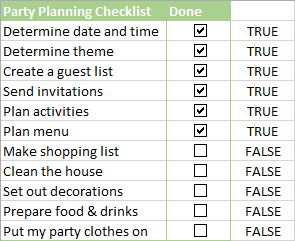 If I have to add another line item within my list, is there a way to reorder them (A-Z for example) and keep my checkboxes with the line item, not the line row? When I sort, I lose my true/false data to the original row. Thank you for the tutorial, very informative. I found your tutorial very helpful! It's very easy to generate the checkbox and customize filtering based on results. In my spreadsheet, I am anticipating data entry into another cell after the checkbox formatting. It looks like when new data is entered and if that data increases the size of the row, the checkbox does not move with the cell. It would be awesome if cell formatting could be accepted by the checkbox. Have you found this to be an issue or do you have a solution? 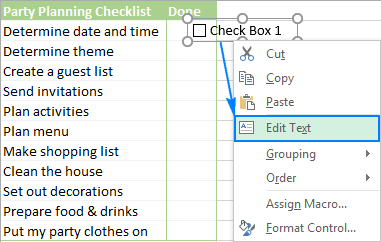 I have inserted a check box in column 'A' via the 'developer' tab and it works ok.
Only problem is that when column 'B' - (which has the 'wrapped text'setting applied) -has text entered and it wraps the text, the column 'A' with the check box suddenly makes a extra check box within the same cell. Any ideas why this may be please? Is it possible to excel in a dropdown list by making multiple selections with check box? Thank you very much for this tutorial, very very helpful. I do have a quick question for you. 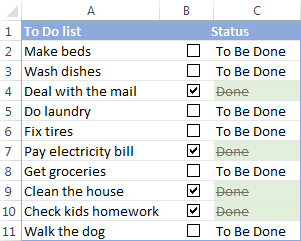 For the step: How to link a checkbox to a cell, any way to apply that to all check boxes ? I'm asking because I have a few thousand rows & check boxes, you can imagine how long that would take me to format each check boxes to link them to the associated cell. Excellent article! Exactly what I needed to know, clearly explained and illustrated! Thank you SO much! You can link the check box to the same cell you are placing the check box and use a font color to hide the value. This is very helpful, but the checkboxes don't appear to work when using grouping and/or filters. The checkboxes don't remain with the line they are attributed to. Any ideas? the DAVERAGE formula should be wrapped by IFERROR in order to avoid division by zero [#DIV/0!] when no region is chosen. Good point, thank you! Added the remark to the tutorial. All that I want is a simple checkbox in a simple cell. A lot of hoo ha in the explanation, and Excel menus are SO cluttered, it takes an extraordinary weird person to find stuff. How about a simple "Add, Checkbox" !!! "Unfortunately, due to the volume of comments received we cannot guarantee that we will be able to give you a timely response. When posting a question, please be very clear and concise. We thank you for understanding!"